The church built in 1031 is surrounded by a vast fortified wall with semi-cylindrical towers. The plan is of a highly compact domed hall. The dome set on a high drum is supported by a system of engaged half-columns having cha­racteristic capitals with volutes and spirals. 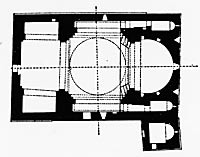 The vast apse has the shape of a horse shoe. The roof is very steep on the exterior, that of the dome is umbrella shaped. The church is flanked by a small chapel lighted by a high lantern on the southern side.